[toc]Post-nasal drip takes place at the back of the throat when excessive mucus generated by the sinuses and nasal glands, accumulates and forces slimy fluid slide at the back of the throat and makes a person uncomfortable. It usually occurs due allergies, sinus infection, cold, flu, gastroesophageal reflux. Amongst these, allergies are persistent in creating post nasal drip especially those that are caused by inhaling paints or consuming certain food like mushroom, or even pollen and dust cause allergies that result in post nasal drip. A person suffering with this post nasal drip or rhinitis can experience sore throat, headaches, discomfort in swallowing or spitting, cracking voice, bad breath and sometimes difficulty in breathing. This disorder is generally seasonal; however extreme pollution or exposure to a lot of dust and cement due to construction work might also cause rhinitis and is not a serious problem that cannot be treated. It is completely curable and that too with natural treatments that are not only effective but also readily available .Some of these natural therapies are discussed below. One of the easiest and simplest ways of getting rid of post nasal drip is by gargling at least two to four times a day. An ideal gargle can be prepared by adding rock salt to water in a proportion of 1:4 and care should be taken to boil the water before adding the rock salt. 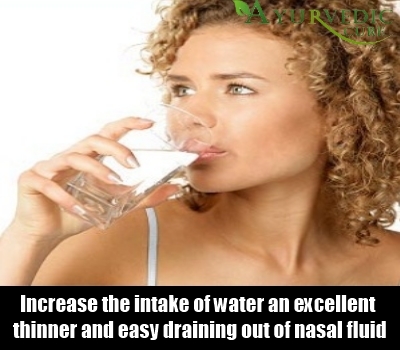 Gargling soothes the soreness of the throat and helps the mucus to thin down and get excreted normally. It is also beneficial in curing the subsequent problems that arise due to the post nasal drip, such as cracking voice and so on. Herbal tea can be prepared from several herbs like Echinacea, basil, fenugreek to name a few. 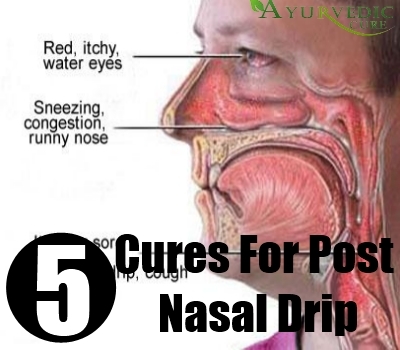 It is highly beneficial in curing the post nasal drip as the herbs not only eliminate the germs but also gives relief to the sore throat. The best way of preparing herbal tea is by steeping either a few leaves or a piece of the root in a cup of boiling hot water and then straining it. It is easy to prepare can be consumed several times a day depending on the potency of the herb. It has multiple benefits and when steaming hot herbal tea is consumed it tends to give relief in the headaches and soreness. 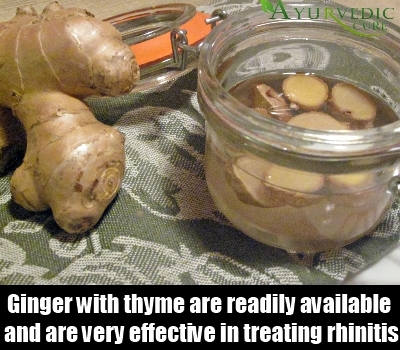 Both thyme seeds and powdered ginger are readily available and are very effective in treating rhinitis. Thyme seeds and ginger can be taken in the ratio of 1:2 and boiled in a litre of water. A teaspoon of salt added to this preparation and the aroma of this solution when inhaled gives prompt relief in stopping the mucus to drip. It is effective in curing the constant sneezing as well. Drinking ginger and thyme tea three to four times a day is equally effective .Ginger can also be combined with honey and given to treat children suffering from this problem as it is a safe and an age old remedy. 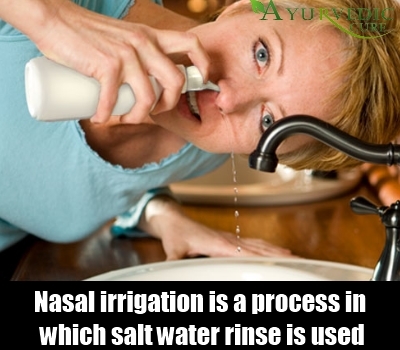 Nasal irrigation is a process in which salt water rinse is used to flush out the mucus from the nasal passage. This is done by taking the salt water in through the right nostril and routing it out through the left nostril. This should essentially be carried out under expert guidance and practiced till perfection is attained. It is one of the best natural methods of getting rid of the mucus and safe when done perfectly. 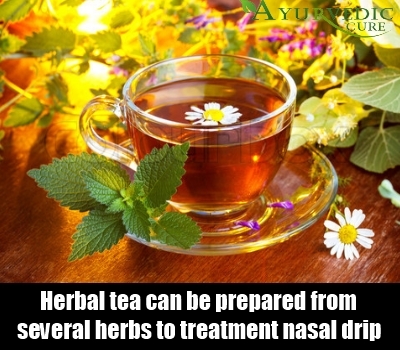 It is not only wonderful for post nasal drip, it is also excellent in treating sinus related diseases and disorders. Nasal irrigation is essentially practiced by naturopaths and have specific vessel with a spout to facilitate this procedure. Ideally it should be performed in the morning but if the problem is persistent then one can even do it twice a day. When a person suffers from post nasal drip she/he should increase the intake of water to more than 4 litres a day as water is an excellent mucus thinner and helps in easy draining out of the nasal fluid. Surplus water in the body helps in opening up of the blockages in relieves one of the congestion and prevents the mucus and infections from spreading on to the chest. It helps in negating the side effects of caffeine that is contributing to the mucus formation , headaches, and also aids in soothing the sore throat .If one suffers from diseases like diabetes then he/she should consult doctor before working on the intake of water.